At the UNILAG main gate, a yellow danfo bus parked just opposite the bold UNIVERSITY OF LAGOS inscription served as a makeshift podium for the protesting students. 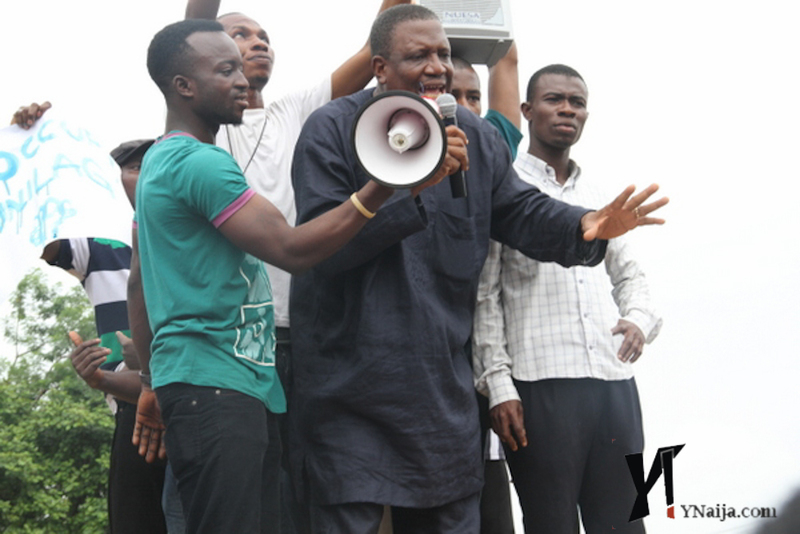 One of the protesters, with a loud megaphone, led the students in a hearty rendition of “Another challenge-o, a greater challenge-o.” It was clear that Unilag students are not taking the change of name to Moshood Abiola University lying low, in this, the 50th year anniversary of the university. Considering the fact that there is no Student Union Government in place in the institution, the speed at which the students organised and gathered in protest was remarkable. They were there in their thousands; their demonstration was loud but peaceful. The Acting Vice Chancellor of the University tried to calm the protesting students, assuring them that, “Even though the management and Senate of the institution were not pre-informed” about the name change, they were on top of the situation and were on the side of the students. But when he asked them to disperse, the response was unanimous: “Go away, go away,” the students chanted. For some, it seems the problem is one of respect and democracy. “We were not informed. Our Senate was not informed. We just woke up today and were told we’re no longer Unilag students. We were not respected enough to be pre-informed. It shows the faults and cracks in our democracy,” said Stacy, another protester. With emotions running high, the students were deaf to any arguments about Abiola’s contribution to democracy in Nigeria. One of the few in support of the name change on the basis of Abiola’s service stood a distance from the upset crowd and made his case amongst friends. “Was Abiola an Akokite?” someone asked him, “He already has a stadium, a polytechnic, a parks and garden named after him. Why must it be Unilag?” Yet another suggested that, “If the university had been renamed for the late Vice Chancellor Tokunboh Sofowale, who served us well, we’ll not complain.” The lone supporter obviously outnumbered and outshouted by the others just shook his head, “You guys won’t understand,” he said. The students demanded an immediate reversion to University of Lagos, with one speaker warning that “in view of this protest, we are not going to class until the name is changed. He [Jonathan] said he had no one to fight, but now he wants to fight Unilag students. We are ready.”As more students began to converge at the main gate and the atmosphere became more charged and intense, the number of policemen mobilised to the university began to increase. To their credit, the officers stayed at a distance, even joining in some light-hearted banter with students. One of the achievements listed by the president on the occasion of his first anniversary was that Mr. President listened to Nigerian youths and rescinded his order for the NFF to withdraw from International Football after Nigerians made passionate appeals on his facebook page. Will Unilag students be that lucky? We’ll see.